Warning: long blog post requires coffee! It has been a good year for movies, and for once the Oscars wasn’t dominated by shocking explosion-centric timewasters. 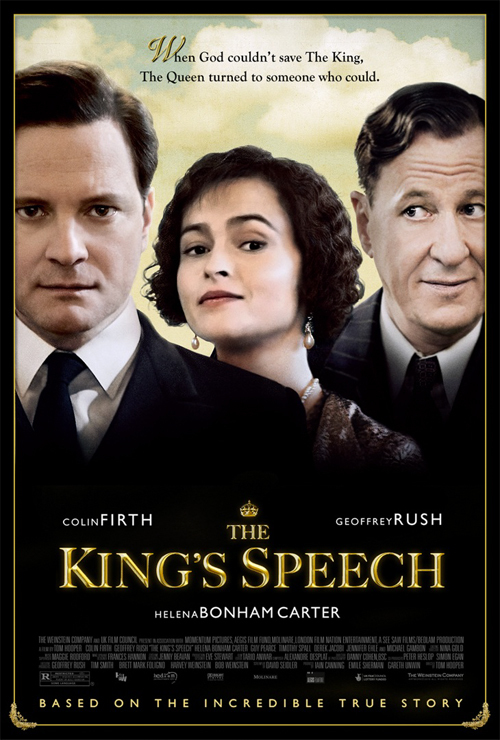 To add to my collection of great books and movies enjoyed this year, The King’s Speech was a sublime movie, one that traded on dialogue, cinematography and solid performances rather than Megan Fox’s less than stellar looks and a brainless actor backlit by explosions on the movie poster. It was also grand to see Helena Bonham-Carter not playing a crazy person. While I always enjoy her performance in the vein of Marla Singer from Fight Club, she was dangerously close to being typecast thanks to the godawful Alice in Wonderland and Sweeney Todd. She was remarkable as Elizabeth and as devoted as anyone could ever hope for in a life partner. She also has that remarkable ability to gently nudge someone in the right direction, no matter how hard it is for them. A wonderful performance, and such a nice change from her usual. The settings were sublime, the costuming perfect and the soundtrack was a rising crescendo of violins that I thoroughly enjoyed and am definitely interested in getting my paws on. I particularly loved Lionel Logue’s consulting room, and I suspect that style of wallpaper or pastiche (I’m not sure how they coloured the walls like that) will quickly become the vogue. A movie made all the more rewarding by background knowledge of the start of World War 2, which is covered discreetly in the background. Timothy Spall made a fantastic Winston Churchill. I would have liked to see more of him, but unfortunately Mr Churchill is one of history’s most biostorous characters and apt to take over an entire movie should he be given more than twenty lines to say. 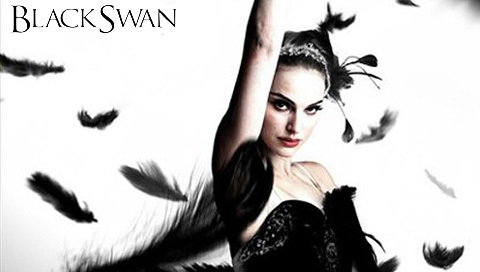 Next on my Oscar Movie list is The Black Swan. I was ready to lobby for a war of letter-writing should Natalie Portman not get the Oscar for Best Actress. Thankfully, she swooped it up and it was deeply deserved. In the kind of role that crawls under the viewer’s skin, Natalie Portman plays a ballerina under a great deal of pressure, both internal and external, and the director Aronofsky drags us with Nina through the looking glass and into the crushing, exacting and relentless nature of her mind. It was a movie that stuck with me for days, and the soundtrack is still my accompaniment at work. For once, the ugly world of ballet is shown for all its difficulty and ruthlessness. It is one of those arts where one in fifty ballerinas becomes a true prima, and the rest stay in the chorus line. It is an art obsessed with thinness and perfection and not one that I would encourage my children to do. There’s blood and hunger and cutthroat competition and Nina is maybe just a year too young or a little too coddled by her mother to deal with the pressure of being the Swan Queen. I found Black Swan to be more in the line of Japanese horror, the kind of passive-aggressive, subtle terror one links to those awful haunted hospitals in Japanese theme parks rather than bland, shouting violence the Americans parade as horror. While Black Swan does not market itself as a horror, I was tempted to leave the theatre, and was begging for the movie to end if only to let Nina escape the twisted horror of her life. Aronofsky, most famous for Requiem for a Dream, is remarkably talented in making the viewer undergo the same horror. In Black Swan, this is done through keeping the camera either over Nina’s shoulder, behind her eyes or right in front of her. There is rarely any distance between us and her, and at times one begged for a long shot just to give me some space. I do not mean any of the above as negative criticism: it makes for true storytelling. Used to the usual saccharine nature of godawful Hollywood fluff, it was a positively raw experience that has restored some credence to the venerable art of filmmaking. I have always been an ardent believer in the power of film to move, especially because it can inspire as many people, if not more, than books. While books still own a large percentage of my passion for words, I believe that films have the power to inform and inspire through their infinite capacity to put sound and image together in a way that can knock against the heart of the viewer. We are not living in an age of widespread imagination, and the very visual nature of our information and entertainment has given film a great deal of power that it has unfortunately squandered on projects like The Hangover and Twilight. Which brings me back to my general delight with this year’s Oscar nominees. While Inception was not very new in concept (despite what people might think, it was very predictable) it was incredibly well shot and the graphics alone deserve an Oscar. Toy Story 3 was a great deal more interesting just for Andy’s off-screen growth and its exploration of the roles toys play in our lives, and how they mark the years. I, for example, have a graduation Rhodent that I am very fond of because he reminds me of how very proud my parents were at my first graduation, and how special that moment was. I will likely keep it even though its unseemly for a grown woman to hold onto toys. Toy Story 3 looks at that, though it does have the usual formula of adventure and relationships. True Grit was divine to look at and listen to. Hailee Steinfield was superb, and her character Mattie Ross is my new favourite female character for her true grit and unfailing strength in such difficult situations. I haven’t seen The Fighter, but I really think Hailee deserved the Oscar. True Grit is quite dark (typical of the Coen Brothers) and while it was maybe half an hour too long, it was still a bold western enjoyable for its dialogue and characters. I watched The Social Network in bits and pieces, but it seemed worthy of its adulations. Since I am a big fan of Facebook (if only because it allows me to try keep touch with rapidly fading friendships, but that’s a blog post for another day), I was interested to see how it was created. I think I am the only person not enamoured of Justin Timberfake’s performance. It also avoided the Hollywood happy ending, which pleases me. For your edification, a picture of RDJ. To make your day sexier. Under this pillow lies the key to my release.